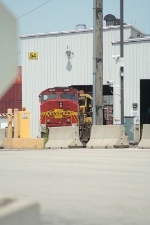 Description: A BNSF GP60M still in Warbonnet colors. Title: Long live the Sanfa Fe! Description: A pair of former AT&SF SD60Ms in Warbonnet paint switch tank cars at a foam plant on the Kimberly Industrial Lead in Fullerton. It took a lot of self disciplinary to not photo shop off the few BNSF markings that are on these units. #149 looks pretty good as it sits, and a little cloning on the "B" end of #104 with a swipe under the window would have just about done it. Description: As a kid I always like the red and silver paint of the Santa Fe Warbonnet paint scheme. I was really happy when the Santa Fe decided to get back to their roots after the ill fated merger attempt with the Southern Pacific, re-painting the blue and yellow engines with the old style red and silver from the the Super Chief. But then the Santa Fe went away and the pumpkins started to appear. What I find interesting is that the Santa Fe still exists in some out of the way places, down some lonely streets and off on the secluded spur lines. It is on those lines as above, the Santa Fe will rise again, if only for a brief moment every now and then. A pair of former AT&SF GP60Ms in Warbonnet paint switch tank cars at a foam plant on the Kimberly Industrial Lead in Fullerton. Description: A rare treat as the BNSF LaC LaC local light engines make a stop waiting for the clear in front of Cage Two of Fullerton Station. Description: BNSF 101, 149 and 7753 on an outbound manifest on the Alameda corridor. Description: BNSF GP60M 149 and 101 on a consist with ES44DC 7753. Description: The local Kings Park power is seen sitting in front of the office, waiting for their next assignment. Description: The Kings Park local switch power is seen tied down for the night. Description: The R CAL0316 12 is seen picking up speed as it heads to Corcoran to take care of the switching duties for the day. Description: BNSF 149 is seen heading up local 316 as it heads to Corcoran on a hot afternoon to perform its switching duties for the day. it's nice to see a warbonet is such great condition, paint scheme wise especially. Description: Local job heading East to switch. Description: Kings Park local power. Nice to see the BNSF patch wearing off! Description: BNSF (ex-ATSF) Warbonnet GP60M #149 trails behind BNSF 170 (a GP60B with an SD40 cab added) as the two return to BNSFs Stockton Yard as a light power move.